As we look around Reigate, we’re struck by the need for some design: Capitalism dominates our environment as much as it does our lifestyle. Above all, to really be an architect, to be creative, Thee Faction feel you have to know the lives of people, their misery, their suffering. The main thing is to be someone who manages to understand life, and one must understand that it is important to change the world. We are looking for coherence. We have to live honestly, live hand-in-hand with each other. There are too many injustices. But commitment to the Communist Party provides hope, solidarity, and the realization that it is possible to struggle together for a better world. So let’s DESIGN a better world. 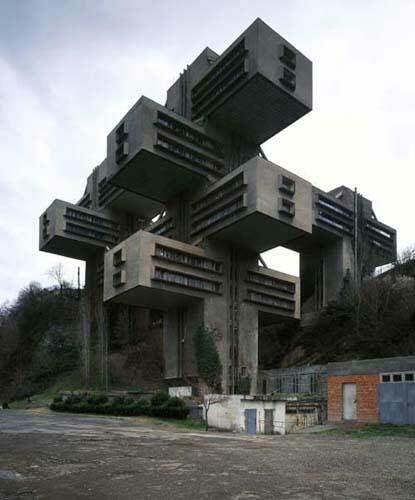 Among the outright gems of Communist Architechture is Georgy Chakhava’s 1975 Roads Ministry building, a monumental grid of interlocking concrete forms rising on a steep wooded site in Tbilisi, Georgia. The project’s genesis might prompt most architects, so often at the mercy of clients’ fantasies, to swoon with envy as Mr. Chakhava was not only an architect but also the minister of highway construction. As such, he was not just his own client; he could also hand-pick the project’s site. 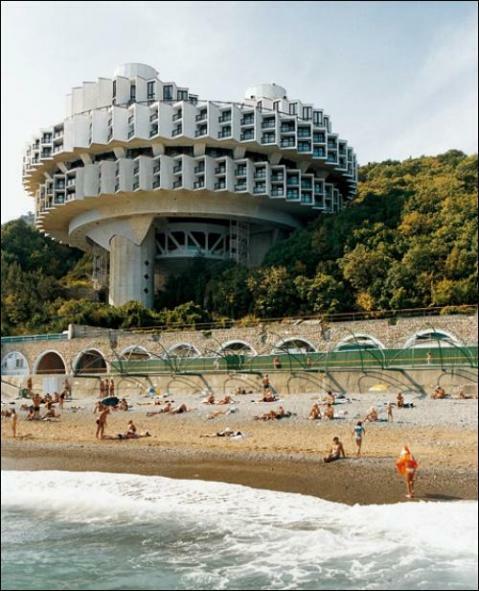 The ministry building’s design also debunks many of the standard clichés we hold about late Soviet architecture. Rising on an incline between two highways, the building’s heavy cantilevered forms reflect the Soviet-era penchant for heroic scale. Yet they also relate sensitively to their context, celebrating the natural landscape that flows directly underneath the building. The composition of interlocking forms, conceived as a series of bridges, brings to mind the work of the Japanese Metabolists of the late ’60s and early ’70s, proof that Soviet architects weren’t working in an intellectual vacuum. 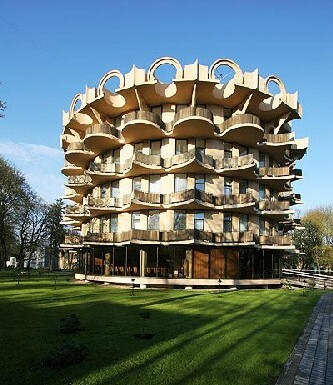 Then there’s the Gaudi-esque romanticism of a sanitarium in Druskininkai, Lithuania, which spins the aesthetic off in yet another direction. Built as a series of interlocking cylinders, its forms are lifted slightly off the ground to create the illusion of lightness. Decorative concrete ribbons spill out over the facade; columns for draining rainwater splay open at the bottom. The building looks as though it’s unravelling, a blend of creativity and madness spilling out into full view. How about a trip to the Armenian capital, Yerevan, to be stunned by an open-air terrace, steps down into the earth, flanked by a pair of immense concrete walls and narrow staircases that evoke the excavation of some forgotten futurist city. This is our vision for the centre of Reigate. 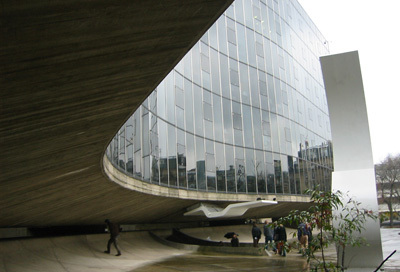 My absolute favourite of course is The French Communist Party headquarters designed by Oscar Niemeyer. Niemeyer’s biggest achievement is the sensory spectacular Brazilian capital Brasilia. In the late 1960s he was forced into exile during the military dictatorship, (which was also anathema to the Tropicalia psychedelic music brigade) and so moved to Paris. The building was built in the early 1970s on a site formerly occupied by workers’ housing at Place du Colonel Fabien in the 19th arrondissement, an area known for its Communist sympathies. It overlooks a square where workers used to gather for entertainment such as animal fighting. Niemeyer, who waived his fee for the building, said it would become a tourist attraction – and he was right, with visitors fascinated by the white dome that rises out of the forecourt in sharp contrast to the sweep of curtain-walled offices behind, known as the “flag” or “wave”. The dome was the last phase of the headquarters to be built, and is the roof of the building’s main conference room, a space dominated by hundreds of hanging metal ceiling tiles. The undulating floor of the building’s foyer is intended to suggest a hillside, it’s unsettling. Niemeyer also designed the furniture. I’ve always liked that the building has several different temperaments. After the cavernous underground areas which feel very secure, you move up into the offices which feel very light and inviting, with two long sides of glass curtain walling bookended by solid ends of ceramic tiles. The single-glazed facade can be opened. Then there’s the roof terrace which is a fairly sculptural element quite different from other parts of the building, with areas cut out at the ends to allow light into what was the top floor café. Architechture creates urban space and a good mood. Upsetting Prince Charles is key. Cultural invention takes its rightful place alongside political action in shaping who we are. Think ahead. Think COMMUNISM.